JDog Junk Removal & Hauling Buffalo South is a local, veteran-owned business. They served their country with honor, and now they pride themselves on serving their community the same way — with respect, integrity and trust. 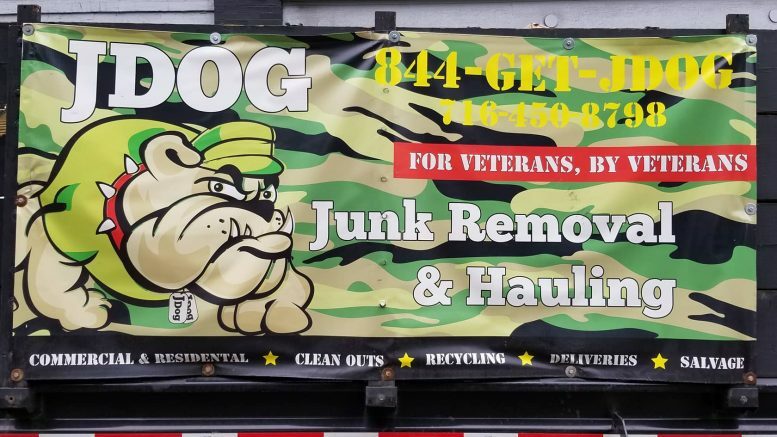 It’s time you met the veterans who own and operate JDog Junk Removal & Hauling Buffalo South. According to local owner Scott Seiberg, JDog Junk Removal & Hauling Buffalo South is a local, veteran-owned business and part of a national franchise totally owned and operated by military veterans and their family members. The company’s goal is to hire 10,000 veterans across the U.S. and to provide customers with the best experience related to their junk removal and hauling needs. You will recognize their crews by their camo trucks and trailers and their military-style uniforms. Serving Western New York residential and commercial customers from North Tonawanda to Jamestown, JDog Junk Removal & Hauling Buffalo South will haul away almost anything, including appliances, home and office furniture, swing sets, hot tubs, construction debris, carpeting, clothing, machinery, tires, televisions, computer equipment, fencing, auto parts, propane tanks, grills, patio furniture, shed and much more. The company is fully licensed and insured, they guarantee their prices and will match any other reputable competitor’s price. JDog employees will also take on minor demolition jobs such as sheds and decks. For more information or a free estimate, please visit jdogbuffalosouth.com, call 450-8798 or email sseiberg@jdog.com. “We are grateful for the strong support the American public provides to veteran businesses and we are committed to exceeding your expectations,” added Seiberg. Be the first to comment on "JDog Junk Removal & Hauling: American owned, veteran operated"